Replacing the two rear tyres naturally included a spot of alignment, and the guy showed me some play in the steering rack. It wasn't a catastrophe, or urgent, by any means but indeed something that needed to be looked at. Later I noticed some oil on the garage floor, at the rear of the car. Closer inspection showed that the differential was leaking, and I could see a small stone (typically used in resurfacing roads) was lodged between the diff and the one axle, obviously damaging the seal. I suspect this was picked up during the road works on the Piekenierskloof pass which we encountered on the way up to Namibia. It had withstood 2000 km worth or travel, so I wasn't going to delay getting this looked at. At best, the diff was simply low on oil, at worst, the gears would have been ground smooth due to heat build-up. I got new seals from the local dealer and took the car to a workshop. Why did I take it to a shop? Well, there were two things I don't really feel I could handle - gearboxes and differentials. After this effort though, and while observing the mechanic, I'll take on the differential by myself now without hesitation. A little later, while doing rotation, the steering rack issue came up again. By now I'd pretty much committed to keeping the car for ever, and solutions to problems needed to be long-term and lasting. 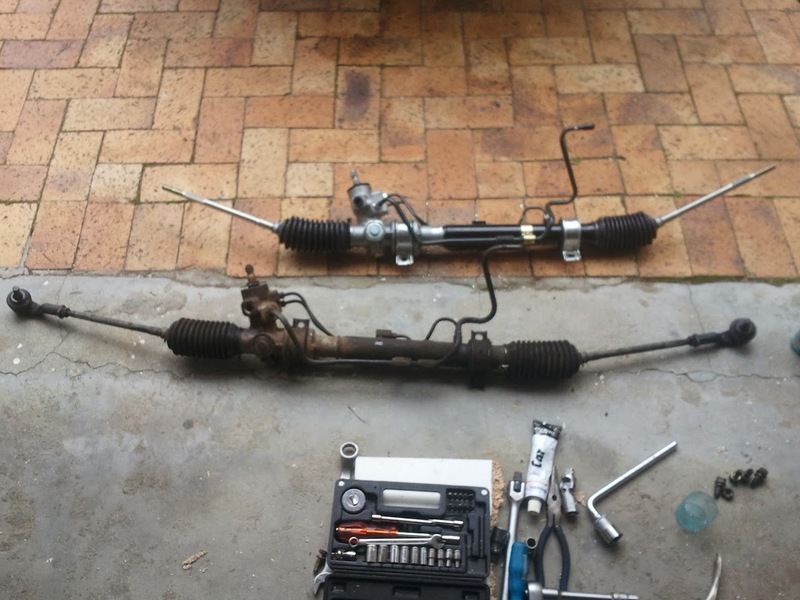 So, I ordered a completely new steering rack. It took some doing removing the old one, and even more doing to fit the new one, but with some help I got it aligned perfectly. The old and new racks next to each other. By now I had quit the owners' club after a year of being chairman of it to spend every waking hour on Stingray Incursion instead. I was driving the car every day still, right until it popped the new relay I had fitted after the Namibia trip. I got another one, which lasted about 3 months, but by now it wasn't popping the relays any more, it was just losing connectivity as a whole. It was very frustrating, and it resulted in me not really being able to drive the car reliably, since it would just cut out anywhere at any time. The wiring underneath the main fuse box in the engine bay was shot, corroded and burning. It had to be addressed. So, I roped in my good electronic engineer friend who, at the time, happened to be working at an auto-electrician workshop. He helped to rewire the main loom and split the main relay out to a new mount we made on the firewall, next to the master brake cylinder. Good as new. But, because of the logistical problems, we used some of our savings to buy a cheap small car as a temporary measure. Now the blue car was practically garaged for weekends only. It also needed a service. So I gave up waiting for the imported filter, and found a close enough match locally.